The first book of my CanLit Project was actually finished a few days ago, but I am only just now getting time to write about it. I quite enjoyed it, but it was different than I was expecting. I hadn’t read any of the reviews before reading it, except for what was on the back of the book. I was expecting to read a light, maybe quirky story about a young girl in the 1940s. Instead, the story was dark, suspenseful, at times violent, with many magical and spiritual elements. The main character, Beth, really has a rough time of it during the year this book takes place. Beth has to put up with her unstable father, bullying from kids at school, the unwanted attention from the boys and men around her, a confusing friendship with a girl her age, and some strange and scary thing following her when she goes walking on her own. Beth listened to stories told by Bertha Moses, who was a friend of her mother’s from the reserve. She told stories about coyotes and shape-shifters that sounded like they couldn’t possibly be true, but which scared her even more. There was almost nowhere Beth could go where she could feel safe. Not even her own house. Her mother did her best, but was already being pushed to her own limits. Her brother ran off to join the war. In the end, she was left with Billy, who was one of the hired hands on their farm, and who seemed to be the only one left watching out for her. A part of this book I really enjoyed was reading about the scrapbook that belonged to Beth’s mother. The scrapbook was her treasure, and it was filled with favourite recipes and other bits and pieces of her life. The descriptions of the way the food was made was almost soothing for me as I read them. So, where does the lightning come in? One night when Beth is out in the fields, bringing in the cows, lightning strikes her arm. From then on, she refers to it as her lightning arm, and from to time to time it behaves as though it has a mind of its own. And, remember the flowers falling from the sky that was part of the praise on the back of the book? Well, flowers did rain from the sky, and it was beautiful. Do I recommend this book? Yes. Although it was a lot darker than I expected it to be, the story drew me in, I liked the cast of characters, and I wanted to find out what the heck was going on. This book is interesting, unpredictable, and unique. 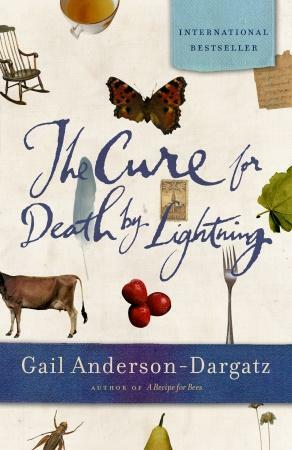 A bit about the Author: Since writing The Cure for Death By Lightning, Gail Anderson-Dergatz has also written A Recipe For Bees, A Rhinestone Button, and Turtle Valley. A Recipe For Bees and The Cure for Death By Lightning were international best sellers, and were both finalists for the Giller Prize. I will let you know what my next book for this project is in my next post! Sounds excellent! I’m putting it on my TR list.